SACRAMENTO, California — Blake Griffin and his Detroit Pistons teammates enjoyed a night of hitting golf balls at Topgolf Roseville on the eve of playing the Sacramento Kings on Monday night. It was the latest in team bonding for the power forward. With Griffin already feeling comfortable and wanted with a Pistons franchise that he believes will be strong next NBA season, he said he has no reason to dwell on his stunning trade from the Los Angeles Clippers in January. “If I wasn’t happy with where I was at or excited to be here, it would take a little bit longer,” Griffin said. “But as soon as I got here to Detroit, the franchise, the way they go about taking care of the players, the way they do everything, is first-class, so that makes the transition much easier. [Coach] Stan [Van Gundy] and the whole staff has been awesome. I’m not looking back. The Clippers granted point guard Chris Paul’s wish to be traded to the Houston Rockets before the beginning of free agency last summer. 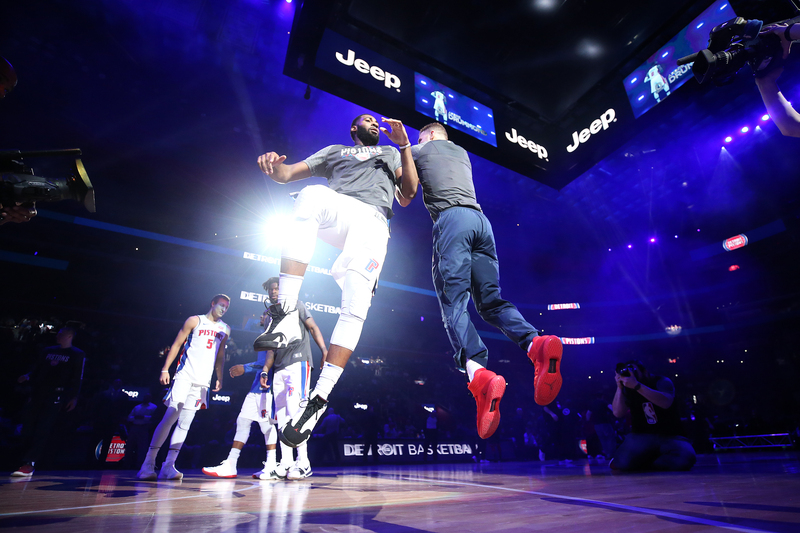 Griffin also was entering free agency last summer, and the Clippers appeared in jeopardy of eventually losing their entire star trio, with center DeAndre Jordan slated to be a free agent this summer. Griffin, however, was quickly sold on Los Angeles’ “Clipper for life” theme as team owner Steve Ballmer, coach Doc Rivers, general manager Lawrence Frank and teammates walked him through an empty Staples Center to show him a virtual celebration of his career with his No. 32 jersey retired in the rafters. No other NBA franchise was a major free-agency threat as the five-time NBA All-Star decided after the two-hour meeting that he would sign a five-year, $171 million contract with the only franchise he had known. Fast-forward to Jan. 29. The Clippers stunned the NBA world by trading Griffin and forwards Willie Reed and Brice Johnson to the Pistons for forward Tobias Harris, guard Avery Bradley, center Boban Marjanovic and a first-round draft pick. A source said the Clippers decided it was best from a financial standpoint to move Griffin in order to acquire future salary cap space. Griffin acknowledged that he would have approached free agency differently had he known he could be traded, but he added there is no need to focus on hindsight. The NBA will have a star-studded free-agency class this summer that could include the league’s biggest star in LeBron James, along with All-Stars Kevin Durant, Paul George and DeMarcus Cousins. For NBA superstars, it would appear the world is theirs when they become a free agent. But even the most powerful players lose a lot of power once they sign a contract, as evidenced by the Clippers trading the greatest player in franchise history so quickly. Griffin truly appears to love playing for the Pistons despite a lackluster record that should keep him out of the playoffs for the first time since 2011. The Pistons beat the Kings, 106-90, on Monday night to snap a three-game losing streak but are six games out of the Eastern Conference’s eighth and final playoff spot with 12 games remaining. Griffin, who had 26 points, 9 rebounds and 7 assists, has yet to play with starting point guard Reggie Jackson, who could return this week from a Grade 3 right ankle sprain. Jackson averaged 14.6 points and 5.5 assists per game before he was injured on Dec. 26. “We’ve been scrambling with Reggie not being back. That’s unfortunate. We’ve had some rough stretches, but I really like this team. I wish we were healthy from the get-go,” Griffin said. The Pistons franchise has three NBA championships, a winning history and a long list of former stars. Griffin was quite a fan of the Pistons team that won an NBA championship in 2004 with Chauncey Billups, Ben Wallace, Rip Hamilton, Rasheed Wallace and Tayshaun Prince. Once-powerful Detroit has struggled of late, as it has been in the playoffs only once since 2010 and has not won a postseason game since 2008. With Griffin, two-time NBA All-Star center Andre Drummond, Jackson, a solid supporting cast and perhaps a talented rookie, Griffin believes the Pistons will be a “very good” team next season. “This summer we will have a chance to really jell, figure stuff out. I think the ceiling of this team is very, very high. We have a lot of different guys who can do a lot of different things who can affect the game in a lot of different ways. Getting Reggie back will be huge,” Griffin said. Griffin spent three days during the NBA All-Star break in Los Angeles with his son and daughter rather than in Detroit. It will likely take time for him to get to know Greater Detroit, where the Pistons play downtown in a new arena and also still practice in the suburbs. What Griffin already understands is that Detroit has a reputation for being a tough, hardworking, blue-collar town. Griffin also has a reputation for being a tough, hard-nosed player who isn’t always beloved by his irked foes but is always respected. He believes his style of play fits well with the Motor City. “I was born in ’89; I wasn’t really watching the true ‘Bad Boy’ era,” Griffin said. “But the [2000s Pistons] was right in my prime of falling in love with the game of basketball and watching everything. I definitely remember all of those teams. But the thing that I really like about Detroit is this city embraces the hard-nosed, gritty, hardworking teams and hardworking players. Griffin will not have a chance to play the Clippers in Los Angeles for the first time until next season. While the Clippers’ second all-time leading scorer says he is focused on his Pistons future, expect him to look in the rearview mirror that night in Staples Center. “I’ll have my chance. I will have plenty of chances,” Griffin said.